In sport after sport, when Pahrump Valley High School teams get to regional play, Boulder City seems to be in the way. Tom Rysinski/Pahrump Valley Times From left, Pahrump Valley's Makalea Petrie and Breanne Nygaard, Boulder City's Sydney Krumm and Ryann Reese meet with the teams' coaches at the first hole Oct. 3 at Boulder Creek Golf Club in Boulder City. Tom Rysinski/Pahrump Valley Times Pahrump Valley sophomore Breanne Nygaard putts during a dual match against Boulder City on Oct. 3 at Boulder Creek Golf Club. Tom Rysinski/Pahrump Valley Times Senior Makalea Petrie swings from the rough Oct. 3 during Pahrump Valley's dual match against Boulder City at Boulder Creek Golf Club. The Eagles are competitive in a lot of sports, and golf is no exception. In this week’s Class 3A Southern Regional Tournament in Mesquite, the Trojans will be keeping a close eye on the Eagles. “Boulder City is the one we’d like to keep up with and hope to beat,” senior Jessica Pearson said Wednesday at Boulder Creek Golf Club. Looking at the numbers, it should be an interesting battle between the two schools. Again. Sophomore Breanne Nygaard, the Trojans’ top golfer, matches up favorably with Ryann Reese, Boulder City’s best. Nygaard has broken 80 three times over five Sunset League outings and two duals against Bishop Gorman, and hasn’t shot more than 90 all season. Reese has been more consistent, but her top rounds are not as strong, always scoring between 81 and 88. And Nygaard said she hasn’t even been playing her best. In similar fashion, senior Makalea Petrie matches up well with Boulder City’s Sydney Krumm. Each shot over 100 once in league matches (the Sunrise and Sunset leagues play on different courses), but Petrie’s better scores are lower than Krumm’s. So, as it often does, it might come down to how deep each team is. Senior Jessica Pearson is optimistic about the Trojans’ chances. The regional tournament is a two-day event on two courses in Mesquite, and Nygaard and Pearson are confident about playing them. “It’s not a hard course, and the greens are really nice so I expect my putting to be good,” Pearson added. Pearson said her chipping was the best it has been last week at Boulder Creek, especially on the 18th hole when she sent an approach shot to within about a foot of the cup. “I was really surprised,” she said with a laugh. The regional tournament began Tuesday at the par-72 Palms Golf Course and concludes today at the par-72 CasaBlanca Golf Course, both in Mesquite. 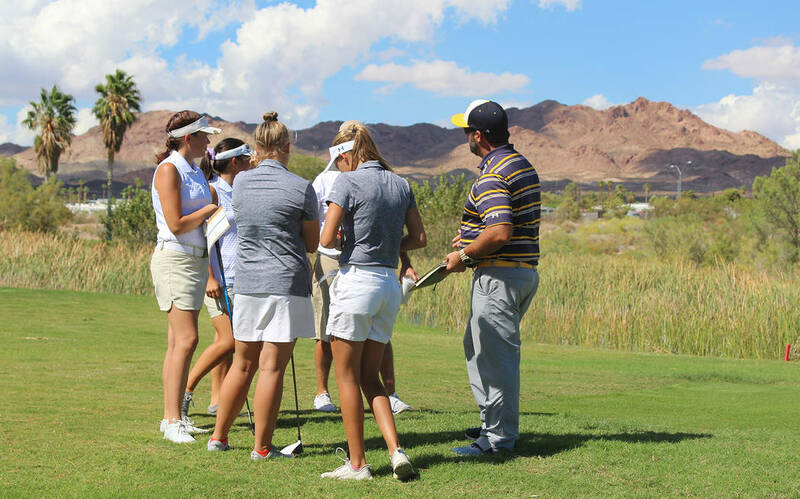 Nygaard, Reese and Carolyn Lemon of Western, who has averaged just under 82 this fall, were paired together in the first group for the first round at The Palms, while Petrie, Krumm and Moapa Valley’s Patricia Slaughter were in the second group. Pearson played with Makaela Perkins of Boulder City and Natalia Facio of Mojave. The fourth group included Alexis Norman of Pahrump Valley, Riley Shuman of Boulder City and Rebecca Raffia of Chaparral. Anastassia Furman of Pahrump Valley played with Boulder City’s Paige Rudd and Valley’s Maylee Tan in the fifth group. The top three teams and the top six individuals from non-qualifying teams will advance to the Class 3A State Tournament on Monday and Tuesday at Schaffer’s Mill in Truckee, California.